Metal-fabrication job shop BMG of Kansas, Inc., from its 50,000-sq.-ft. location in Hesston, KS, churns out cut and formed mild-steel parts by the tens of thousands, with a focus on mild steel from 22 gauge to 1 in. thick. With the sweet spot being 14-gauge sheetmetal to 1⁄2 in. plate, high-power laser cutting has been the company’s go-to fabrication process, supplemented by state-of-the-art press brakes (some with automatic tool-change capabilities) to help keep up with the escalating part volumes flying off of its lasers. Early in 2017, fabricator BMG of Kansas brought in its second 6-kW fiber-laser cutting machine to round out its stable, for work thicker than 1⁄4 in. BMG originated as an OEM manufacturer of hay-processing and related farm equipment in 1985; it evolved fully into a job-shop fabricator in 2000, under the ownership of the Brenneman family. Today, according to COO Doug Brenneman, the company operates four laser-cutting machines (all Amada units)—a 6-kW CO2 machine and three fiber-laser machines (one 4-kW and two 6-kW units). BMG’s initial fiber-laser cutting machine, when cutting with nitrogen, doubled the cutting speed on material to 1⁄8 in. thick compared to using CO2 machines. Cutting speed for the company doubled again when it upgraded to a 6-kW LCG-AJ machine (above). As an example, when processing 11-gauge mild steel (the nest on the right), cutting speed went from 300 in./min. with the 4-kW fiber laser to 630 in./min. with the 6-kW machine. On the left: 7-gauge steel cut at 310 in./min. That initial fiber-laser cutting machine, says Brenneman, when cutting with nitrogen, doubled the cutting speed on material to 1⁄8 in. thick compared to using CO2 machines. Cutting speed for the company doubled again, when it upgraded to a 6-kW LCG-AJ machine (see the accompanying graph). As an example, Brenneman says that when processing 11-gauge mild steel, cutting speed rose from 300 in./min. with the 4-kW fiber laser to 600 in./min. with the 6-kW machine. 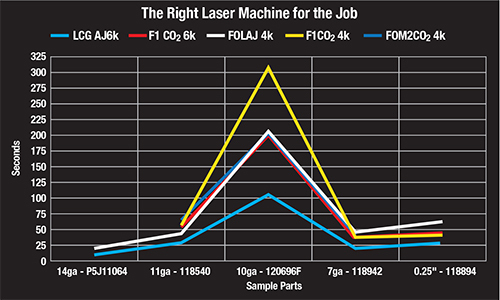 Shown is how cutting speed and, ultimately, the processing time required to cut specific parts at BMG, varies based on material thickness and the type of laser-cutting machine. Brenneman again offers an example, citing a cutting speed of 70 in./min. on 3⁄8-in. plate with the 6-kW CO2 machine, and 95 in./min. on the 6-kW fiber machine cutting with oxygen. That oxygen process, Brenneman explains, revolves around tweaking the cut conditions provided by Amada. Technicians adjust laser-pulse frequency as well as the ratio of beam power to cutting speed, to obtain the desired edge quality. BMG’s laser-cutting machines run 24 hours/day, five days/week. However, the company does not run lights-out or unmanned. Instead, explains Brenneman, it prefers to staff the shop while the machines run, so that operators can pull parts from the nests and stack them immediately, rather than coming into work in the morning facing stacks of nested parts waiting to be separated and sorted. “We have found that the labor savings gained by sorting each nest as they are completed provide a better return than does running lights-out,” Brenneman says. Another cost-saver for the company: use of a pressure-swing adsorption (PSA) system to generate the nitrogen it needs to feed its four laser-cutting machines. Compared to the costs of having nitrogen cylinders delivered to the shop by a local gas distributor, or having said distributor regularly fill an onsite bulk tank, generating nitrogen onsite from dry, compressed shop air with its PSA system saves BMG thousands upon thousands of dollars/yr. Analysis conducted by Brenneman shows that on an annual basis, the shop would have to spend $186,000 on liquid nitrogen. Generating its own nitrogen costs the company $56,000/yr. to feed its four machines, for an annual savings of $130,000.